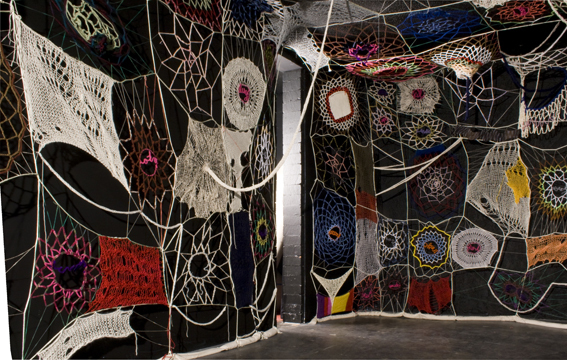 Originally installed in 1972 at Womanhouse (533 Mariposa St. in Hollywood), Faith Wilding’s Crocheted Environment, 1972, was made out of what she calls “women’s work,” and was an attempt to bring traditional feminine creative practices into the mainstream of contemporary art. 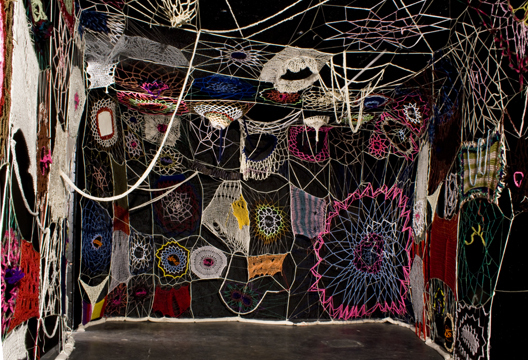 In “Womb-womb Room,” a re-creation of the “Womb Room,” Los Angeles artists Alexandra Grant and Channing Hansen and Alexandra Grant engaged in a conversation about feminist art and its meaning today, “women’s work,” and the nature of recreating a “seminal” work of art. 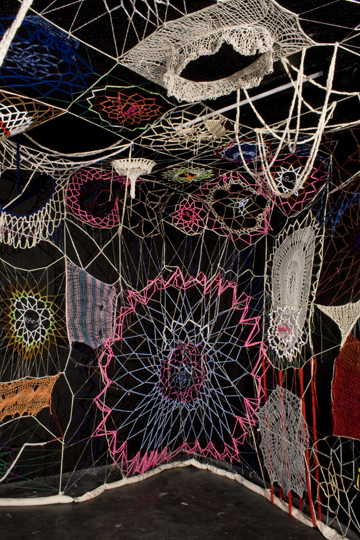 In the context of Pacific Standard Time shows, Grant and Hansen reimagined Wilding’s original as a collaborative act, using found, high-tech and second-hand materials which they crotcheted and knit into a room.